My first time on a tenniscourt, when I was 8 years old - not a big success. The funny thing is that when I entered a tennis court for the first time just before I turned 9 it didn’t look like it was going to be a long relationship. I have been active with sports ever since I can remember. I have tried a lot of different things like swimming, judo, capoeira, dance, gymnastics, rope skipping and football (soccer) before tennis. I have played soccer since I was 5 and liked it a lot. Being on a team, celebrating wins together and helping each other through defeats. It was so much fun. I was sure that soccer was the right thing for me. I thought soccer was going to be my sport - but that changed! But then my dad asked my brother and I to join him on the tennis court. Just to try it out. I was so bad at it, like really really bad and I got very upset and frustrated because I couldn’t hit the ball properly. My parents tried to explain to me that is was perfectly normal not being able hit a perfect shot the first time on court. But I wouldn’t listen. I remember wanting to make that sound that my dads racket made when he hit, but that for sure didn’t happen that day. My mom asked my dad to never take us there again. But tennis got under my skin. I wanted more. Together with my brother and a friend I began playing mini tennis once in a while with foam balls. Soccer was still my main priority - but then came summer and with that the possibility to play on the clay courts. Since that I never looked back. I begged to play tennis whenever I got the chance. My dad, mom, brother and I was always on the tennis courts. We played for hours every day, stayed until it got dark. I remember that my mom packed our dinner to bring to the court in order for us to get more time to play. I loved everything about it, being together as a family and constantly improving my game, discovering new things, getting better one step at a time. That amazing summer is printed in to my memory. I do think that I have forgotten the many times I was angry, upset and frustrated because I didn’t master the game right away. Tennis is really difficult to learn but that’s actually what I like about it, even though I have to remind myself when it does drive me crazy not hitting the way I want to. After training for 4 months I signed up for the U10 championship in my club and won! Nobody had seen it coming, maybe except for my parents, because they know that when I decide to do something I give it everything I got - no matter what. My technique was horrible, it looked like I was playing baseball but I ran and fought to win every ball. 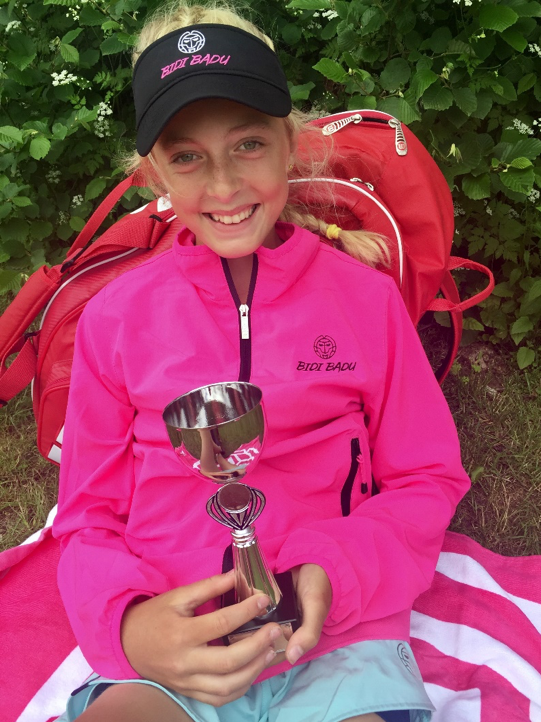 After playing tournaments for 6 months I was selected to participate on a camp for top 8 U10 players in Denmark. 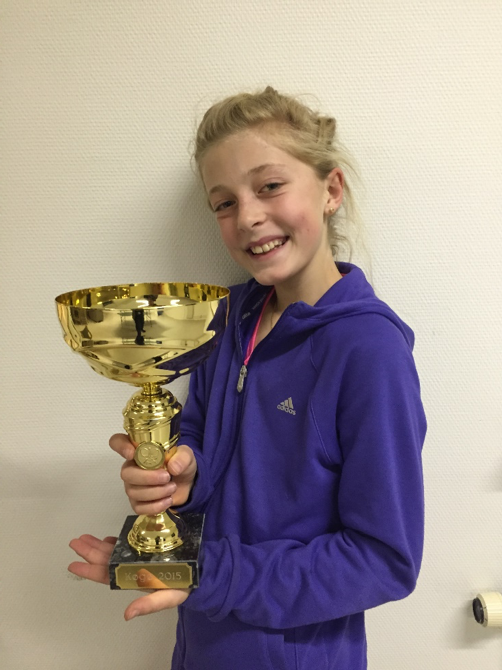 Last year I won several U12 Kat 1 (highest) tournaments in Denmark and finished the year winning one of Sweden’s biggest indoor tournament - the Fairplay Cup U12 Grade 1. I also won - as a first year U 14 player both the regional indoor and outdoor championships. The biggest thing for me so far, is not winning individual tournaments, it is being selected to represent my club playing at the senior elite series team. I have been playing on the team since February 2017. I was very nervous before playing my first team match, I didn’t want to let the team down, but everybody was so nice and supportive to me and it went well. Now I’m a core team member and I prioritize the team matches higher than anything else. I will never forget the warm welcome I got and I will make sure to pass that on to the next new team member. I’m still working hard to improve every aspect of my game and my main focus right now is working on how I approach the game mentally. I’m a perfectionist and when I’m not hitting every single ball perfect I immediately focus on what I do wrong and that I should have been able to do better. If I hit say 20 fantastic back hands and miss Nr. 21 then my whole focus is on ball Nr. 21 - And let me tell you, it is not a positive focus. Tennis for me is more than a sport, it is buck loads of fun and hard work, it is learning to take full responsibility for my actions, my progress and my results, it is being together with my friends and family, and last but not least I’m sure it is lessons learnt for life, lessons that in the end will help me to develop in to a better human being. Have you ever played a singles match and felt your mind is the second opponent you play?